Rare is the property that sits on an even grade. Most pieces of property have at least small changes in elevation, and these changes in elevation add interest and visual appeal–if you know what to do with them. The best way to deal with hills and difficult grades in your landscaping is to build retaining walls. 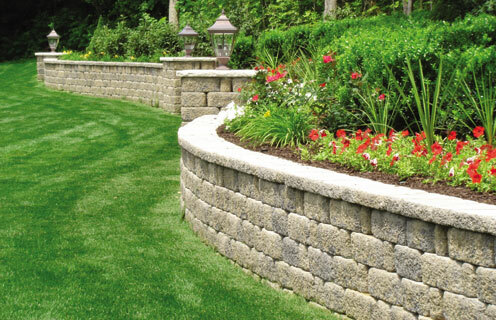 Retaining walls do more than create interesting highs and lows in your yard. They also help to control erosion, manage drainage, and better utilize your space. When considering building retaining walls on your property, think carefully about what kinds of materials you will use. There are several different types of retaining wall block on the market today, and these retaining wall blocks will give you many different looks. Below we’ve listed four main types of retaining wall options landscape and explained their benefits and limitations to help you decide which type of retaining wall block would work best for your landscaping. 1. Concrete Block. If you’re looking for an affordable solution, concrete blocks may be the retaining wall block for you. Depending on the style of concrete block you choose, your walls could look sleek, complicated, or even natural to your existing landscaping. Benefits. Concrete blocks are affordable, sturdy, and modern-looking. They’re also easy to install and come in a variety of colors and textures. Limitations. When using concrete blocks for retaining walls, the walls must be kept under four feet tall to remain structurally sound. 2. Stone Veneer. Those seeking a natural look might opt for stone veneer for their retaining wall blocks. Stone veneers can give you a custom look that matches your existing patio, your home’s architectural details, or other hardscape elements in your landscaping. Benefits. Stone veneer retaining wall blocks are very durable. They withstand all kinds of weather and look freshly installed for years to come. Limitations. Stone veneer can be tricky to work with. Generally, stone veneers requires a landscape design professional for proper installation. 3. Brick. If you love a traditional, classic look, investigate the use of brick for your retaining walls. Brick retaining wall block comes in a variety of colors and finishes. You can get brick that looks old and worn with rounded edges, or it can look sharp and modern. Benefits. Brick is strong and durable. You can special order brick that will match your house, so the overall look of your landscape is cohesive and harmonious. Limitations. Brick is labor intensive to install, and your building site may require special accommodations to deal with drainage issues. 4. Dry Stone Boulder. A natural-looking landscape benefits from a dry stone boulder retaining wall. Dry stone boulder walls hearken back to colonial New England landscapes when stone walls were common between pieces of property. Benefits. Dry stone boulder is the most natural-looking way to deal with a grade change on your property. When installed well, it looks as if it has always been a part of your landscaping. Limitations. Water can accumulate in the interior of the wall, and if it does so, it will destroy the wall’s integrity, leaving it vulnerable to erosion and other pressures. With so many options, it can be difficult to choose the retaining wall block that appeals most to you. In this case, it’s wise to consult with a professional landscape designer in Omaha. A landscape designer will have insights into which options best suit your landscaping, not only in terms of looks and design, but also in terms of practicality and durability.